My girls and I love a book series with strong female characters in the leading roles. I read every mystery story in my hometown library as a girl—and find myself rereading many of them again with my daughters. We were excited to read and review the first book from Iain Reading’s, young adult Kitty Hawk Detective Agency series, Kitty Hawk and the Curse of the Yukon Gold. We also have an ebook giveaway of the book for one of our readers. What did we think of Kitty Hawk and the Curse of the Yukon Gold? Quick Summary of Kitty Hawk and the Curse of the Yukon Gold. This is the first book of the Kitty Hawk Flying Detective Agency series introducing Kitty Hawk, an intrepid teenage pilot with her own De Havilland Beaver seaplane and a nose for mystery and intrigue. A cross between Amelia Earhart, Nancy Drew and Pippi Longstocking, Kitty is a quirky young heroine with boundless curiosity and a knack for getting herself into all kinds of precarious situations. Reading creates a wonderful blend of fact and fiction. When my middle daughter opened the book, I think she was initially taken aback by the sheer amount of text on the pages. After a few pages, she loved it! This book is loaded with descriptive scenes, a well-researched and well written dialogue, detailed settings, and historical references—but, these elements are all woven flawlessly into each day of Kitty Hawk’s adventures. I have even caught the girls researching some of the locations and events mentioned in the story! Kitty Hawk gives girls an updated, girl-detective, role model. Kitty Hawk is more than a girl caught up in a mystery—she is a strong, resourceful female with convictions, dreams, goals, a mind of her own—and even occasional self-doubts. The author creates a modern, more realistic heroine in Kitty Hawk. Would I recommend Kitty Hawk and the Curse of the Yukon Gold? This is a mystery/adventure book that is interesting enough for young adults (and even older parents)—and cleanly written enough for younger tweens with higher reading levels. We are looking forward to reading the other books in the Kitty Hawk series—and we look forward to more from this author. Would you like to start your Kitty Hawk Flying Detective Series with a free ebook? 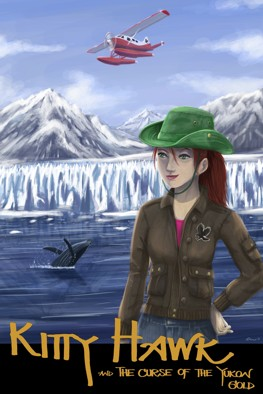 Enter to win an e-copy of Kitty Hawk and the Curse of the Yukon Gold! I'm so glad you and your daughters enjoyed reading Kitty Hawk! Loved reading your review, and hearing your thoughts.